Mudflats, tide pools, and coastal wetlands: the margins between the land and the ocean where much of life on Earth began. This painting was an opportunity for me to explore different textures, surfaces, patterns, and the effects of light on the surface of shallow water. 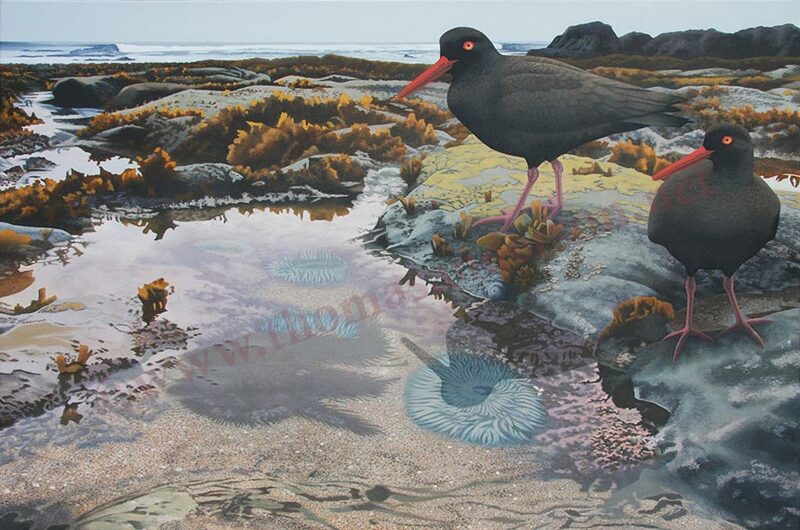 An added bonus that day was “capturing” a pair of birds seen almost exclusively in rocky tide pool habitats, Black Oystercatchers. With their commanding dark shapes accented with red eyes, bills and pink legs, they completed this depiction of the feast of the food web. It was a feast for my eyes as well, a banquet in all senses.